Associated Bank’s Women’s Network (AWN) of Central Wisconsin, along with a few other Associated Bank colleagues, recently assisted at a Habitat for Humanity build in Stevens Point. The AWN is focused on fostering an environment and promoting collaboration of women at Associated by highlighting elements of personal development, professional advancement, and overarching wellbeing. The team of women often volunteers together within the community to support local non-profit organizations. Renee Carlson, default services manager at Associated Bank, felt good to be part of a project that provides a home to a family in need. “The way that the construction crew, Associated Bank and the family all worked together to build this house was amazing,” Carlson said. The team acquired new construction skills as they worked diligently on the house. Some AWN members worked on framing, while others worked on installing a second story deck and the subfloor for the house. Each colleague expressed that volunteering for Habitat was well worth the time and effort. 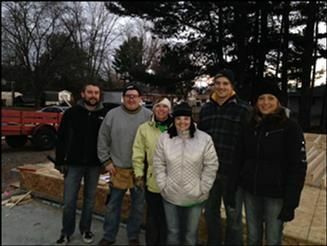 Photo caption: Max Glass, Doug Spindler, Kathy Dodge, Renee Carlson, Tyler Crawley and Pattie Stanislawski support Habitat for Humanity in Stevens Point by participating in a build.